For many of us it still feels as though winter’s icy grasp is reluctant to let go, though with the clocks going forward at the weekend technically spring is right around the corner. Research by MoneyMagpie in 2017* found that 50% of the UK population has ditched the traditional spring clean citing a lack of time, apathy and the on-going cleanliness of the home as their reasons for doing so. The Association of professsional Declutterers & Organisers (APDO) is keen to ensure that this valuable chance to clear the decks of any physical (and consequently mental) clutter is not abandoned too, so they have launched Spring Clearing Week in 2018 to highlight the benefits of an annual review of our ‘stuff’. But when faced with over-spilling drawers, seething under-stairs cupboards and sheds, garages and attics that were last looked at when you first moved in, many of us balk at the idea of chipping away at the clutter. That’s why APDO members around the country will be helping the public to declutter and clear out after the dreary winter months to help revitalise their environment with renewed energy and vigour. In Devon, local declutterer, Jasmine Sleigh from Change Your Space will be speaking at Exmoor U3A during Spring Clearing week, plus she will be offering Q&A sessions at the local Exmouth charity stores, and presenting a workshop on clearing our clutter in Exeter and Newton Abbot. She will be appearing at the Devon Air Ambulance Budleigh Salterton charity shop on Wednesday 28 March at 2pm to help customers with some top decluttering tips. And of course, a revived living space is not the end of the story. The lifespan of your pre-loved items, from bric-à-brac to party frocks can be much extended by donating to charity. All of our Devon Air Ambulance shops are delighted to receive donations as all the money raised from those sales goes back into keeping our helicopters flying. 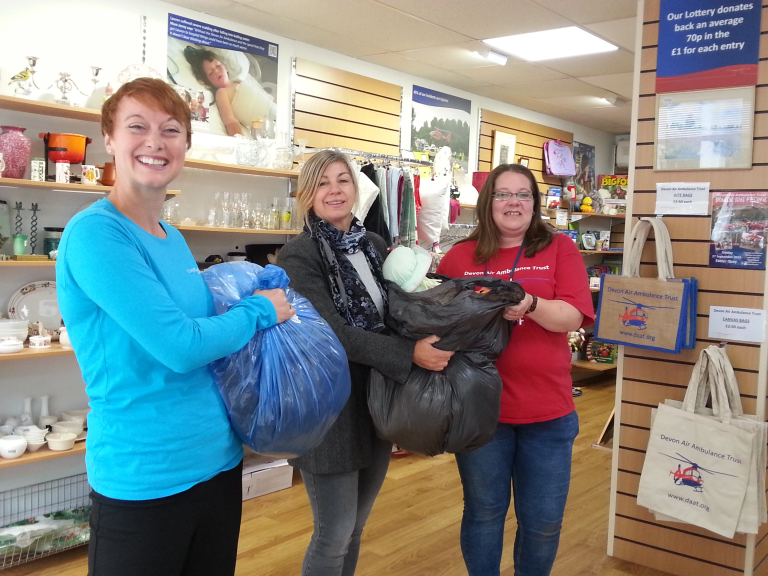 If you would like to make a donation to one of our charity shops just pop in with your items. You can find a list of our shops here. Don’t forget to pop along to speak to Jasmine at 2pm on the 28th for fresh decluttering insights and to bring in the spring to your home!